Dixfield • The Only One | Dixfield, Maine, incorporated in 1803, is a small town located in the Western Foothills of Maine in a region known as the River Valley area. The agenda for the April 7th meeting is available at the link below. Minutes of the February 10th Recreation Committee meeting. NOMINATIONS for (2) 3 yr term Selectmen positions and (1) 3 yr term RSU 56 Board Member! Papers to fill out are available at the Dixfield Town Office. Nomination papers need to be turned in by April 12th, Friday at the Town Office. REMINDER!! 2nd Tax payment is due by April 15, 2019!! For copies of birth, death and marriages certificates please open the link below and print the request form. Have this filled out prior to arriving to the town office. Thank You! PAYMENTS CAN NOW BE MADE ON-LINE FOR WATER AND SEWER BILLS! The Town of Dixfield is pleased to offer our residents the option to pay water and sewer bills online. Please note, we use a third-party payment processor, Maine Payport, that will charge a 2.5% service charge on the transaction. The additional fee does not go to the Town. This is the same service provider that is used a when payments are made in person at the Town Office. The credit card swipe is now operational at the Town Office for your convenience. 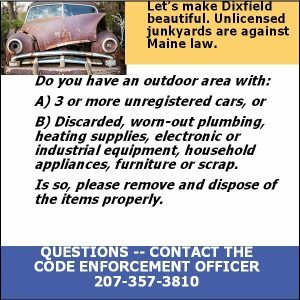 To view the Town of Dixfield’s updated Appeals Board Ordinance or Sewer Use Ordinance, click on the links below.